Greek Neo-Nazi Party Arrests Follow High-Profile Murder : The Two-Way The Golden Dawn party has long been suspected of carrying out violent attacks against immigrants, but the Sept. 18 killing of an anti-fascist rapper incited national outrage. The leader of ultra-right wing Golden Dawn party Nikos Michaloliakos is escorted by masked police officers from the police headquarters in Athens on Saturday. Greek police arrested the leader of the neo-fascist Golden Dawn party Saturday on charges of establishing a criminal organization. The police also issued warrants for more than 30 party members — including six members of parliament — on charges of murder, money laundering and other crimes. 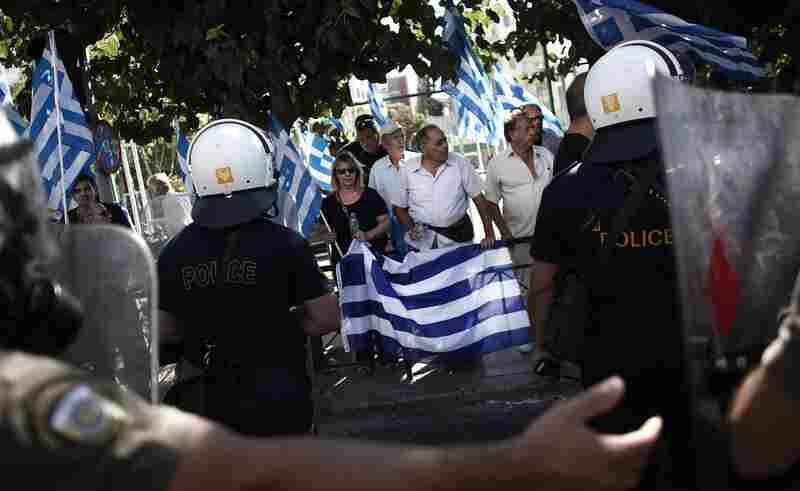 Greek TV stations interrupted regular programming to show live scenes of the Golden Dawn members led away in handcuffs. It's the first time since 1974 — when a seven-year military dictatorship ended — that sitting members of parliament have been arrested. "Members of parliament in Greece usually have immunity, which means they cannot be prosecuted and arrested unless parliament gives its permission," Tania Dionysopoulou, a lecturer in criminal law at the University of Athens, told NPR. "But that immunity does not apply to flagrant, serious crimes where there is strong evidence, as appears to be the case here." Just three years ago, Golden Dawn was an obscure group, marginalized by most Greeks as neo-Nazi thugs, and it received just 0.23 percent of the vote in 2009 parliamentary elections. But after the debt crisis destroyed faith in mainstream politicians, the group rebranded itself as corruption-fighting patriots and blamed the country's problems on undocumented migrants and politicians who work for "Jewish bankers." In elections last year, the party won 7 percent of the vote and 18 seats in the 300-member parliament. Golden Dawn supporters have long been suspected of carrying out violent attacks against immigrants, especially those of South Asian and African descent. In a recent report, the Greek Ombudsman noted at least 281 racist attacks in the country — including four murders — between January 2012 and April 2013. "These arrests should have happened a long time ago," says Dimitris Psarras, an investigative journalist who wrote The Black Book of Golden Dawn, the definitive study of the group. "It's not like the police didn't have evidence that the party is violent." But it took a Golden Dawn supporter's alleged involvement in the Sept. 18 murder of a 34-year-old Greek, Pavlos Fyssas, to incite national outrage, protests and now arrests of the party's members. Fyssas was a rapper who performed under the name Killah P and whose lyrics condemned racism and fascism. He had just left a cafe in Amfiali, a working-class neighborhood south of Athens, where he had been watching a soccer match on TV, when a gang of at least 10 men wearing black shirts and camouflage jumped him. A 45-year-old man who has been identified in the Greek press as Giorgos Roupakias allegedly stabbed Fyssas in the heart. Outrage over his murder prompted an investigation into connections between the Greek police and Golden Dawn. So far, the probe has resulted in the resignation of two senior policemen and the suspension of four others. Christos Stamou, a 21-year-old college student studying economics, says he believes the police have "looked the other way" while Golden Dawn's armed paramilitary gangs posing as neighborhood watch groups have terrorized the streets of Greek cities. "People don't trust the police," he says. Dimitrios Kyriazidis, a retired police officer and parliamentary deputy with New Democracy, the ruling conservative party, has long warned that Golden Dawn functioned as a "criminal gang" that encouraged Greeks to become vigilantes instead of law-abiding democrats. "They must be stopped before their power becomes an unbreachable wall," he said. Golden Dawn insists that the party was not involved in Fyssas' murder — or any other violence — and says the crackdown is a witch hunt. "This is the political murder of a legal political movement," declared Artemis Mathaiopoulos, a Golden Dawn lawmaker from the northern city of Serres. "We will fight until the end." The party claims its members are the victims of a conspiracy by corrupt politicians and international bankers. They called on their supporters to protest outside police headquarters. Early Saturday morning, police raided the home of Golden Dawn leader Nikolaos Michaloliakos, a mathematician-turned-army commando known for his Nazi-style salutes and violently racist and anti-Semitic rhetoric. Officers discovered three unregistered guns there, private TV news channel SKAI reported. Party spokesman Ilias Kasidiaris, who denies the Holocaust and made international headlines last year for slapping a female lawmaker on live TV, was also arrested. The party had been planning to nominate him as a candidate for mayor of Athens. 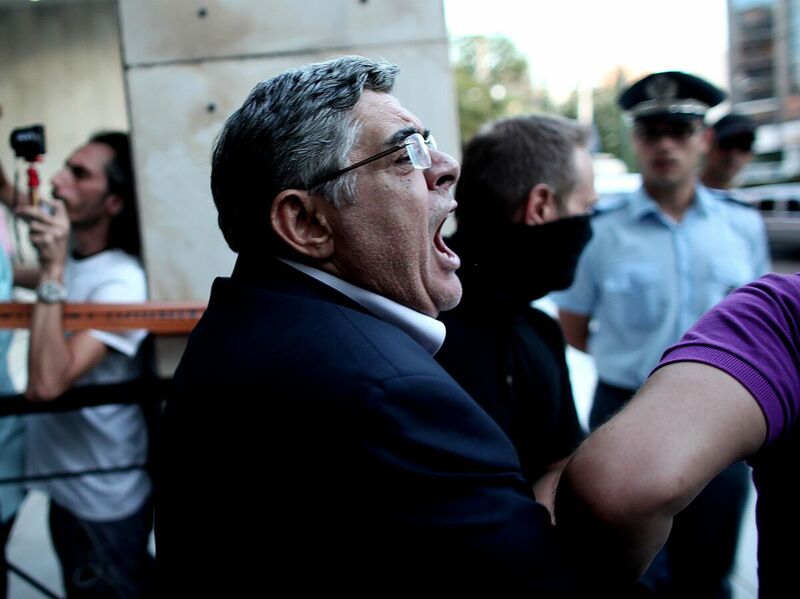 Golden Dawn leaders in the Nikaia district, which includes the area where Fyssas was killed, have also been detained. Michaloliakos has threatened to pull out Golden Dawn's 18 lawmakers from the 300-member parliament. Prime Minister Antonis Samaras told reporters Saturday that neither a walkout nor the arrests will lead to new general elections. Polls show that most Greeks do not want another round of elections, even though nearly everyone is unhappy with circumstances in the country, where unemployment tops 27 percent. Psarras, the Golden Dawn expert, says he expects the party to struggle now that their leader, Michaloliakos, has been jailed. "This is a party of sheep who follow their leader," he says. "And now, finally, they're cut off from the world for the first time." Some polls show that if Golden Dawn collapses, its voters may migrate to Samaras' conservative New Democracy party, which leads Greece's two-party coalition government. Georgia Zafeiri, a 19-year-old medical student, says she would like to believe that most of her fellow Greeks who voted for Golden Dawn in 2012 elections are not fascists. "I'd like to think they're unemployed people who lost hope and looked in the wrong place for a savior," says Zafeiri, who joined thousands of Greeks in an anti-fascism march in Athens last week. "I hope they see that now."